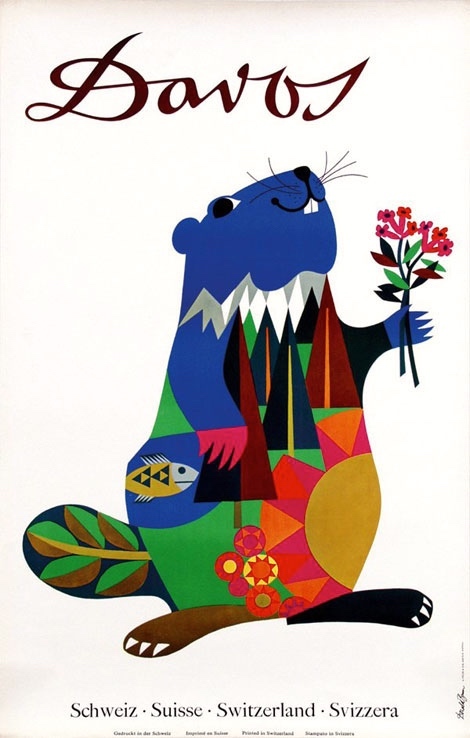 But in my naive North American way, I took the creature in the poster to be a beaver, while it turns out to be a cousin of the beavers (genus Castor), the Alpine marmot (Marmota marmota), which is something of an icon for the canton. Also much more closely related to the North America groundhog (Marmota monax) than to beavers. Some species live in mountainous areas, such as the Alps, northern Apennines, Carpathians, Tatras, and Pyrenees in Europe and northwestern Asia; the Rocky Mountains, Black Hills, the Cascade and Pacific Ranges, and the Sierra Nevada in North America; and the Deosai Plateau in Pakistan and Ladakh in India. Other species prefer rough grassland and can be found widely across North America and the Eurasian Steppe. The similarly sized but more social prairie dog is not classified in the genus Marmota, but in the related genus Cynomys. Marmots typically live in burrows (often within rockpiles, particularly in the case of the yellow-bellied marmot), and hibernate there through the winter. Most marmots are highly social and use loud whistles to communicate with one another, especially when alarmed. Marmots mainly eat greens and many types of grasses, berries, lichens, mosses, roots, and flowers. The ground squirrels are members of the squirrel family of rodents (Sciuridae) which generally live on or in the ground, rather than trees. The term is most often used for the medium-sized ground squirrels, as the larger ones are more commonly known as marmots (genus Marmota) or prairie dogs, while the smaller and less bushy-tailed ground squirrels tend to be known as chipmunks. Together, they make up the “marmot tribe” of squirrels, Marmotini, and the large and mainly ground squirrel subfamily Xerinae, and containing six living genera. Well-known members of this largely Holarctic group are the marmots (Marmota), including the American groundhog [Marmota monax], the chipmunks [genus Tamias], the susliks (Spermophilus), and the prairie dogs (Cynomys). They are highly variable in size and habitus, but most are remarkably able to rise up on their hind legs and stand fully erect comfortably for prolonged periods. They also tend to be far more gregarious than other squirrels, and many live in colonies with complex social structures. Most Marmotini are rather short-tailed and large squirrels, and the alpine marmot (Marmota marmota) is the largest living member of the Sciuridae, at 53–73 cm in length and weighing 5–8 kg. Beavers, along with pocket gophers and kangaroo rats, are castorimorph rodents, a suborder of rodents mostly restricted to North America. … The North American and Eurasian beavers are the only extant members of the family Castoridae, contained in a single genus, Castor. Most of these creatures are viewed as agricultural or garden pests. So marmots are, roughly, really big (ground) squirrels, and share many behavioral characteristics with them; and they superficially resemble compact versions of beavers, but are burrowing rather than dam-building creatures. Origin: A borrowing from French. Etymons: French marmotte, marmot. Die Murmeltiere (Marmota), in der Schweiz auch Munggen, in Oberbayern und Österreich auch Mankei genannt, sind eine aus vierzehn Arten bestehende Gattung bis zu 50 Zentimeter langer Echter Erdhörnchen (Marmotini), die in Eurasien und Nordamerika verbreitet sind. The name Murmeltier just cries out for folk etymology, relating it to the verb murmeln ‘to murmur’ (onomatopoetically, from the animal’s cries or whistles) or possibly to the noun (die) Murmel ‘marble’ (perhaps from the animal’s statue-like motionless posing on its hind feet). Both possibilities have been suggested in actual etymologies. Marmots can be heard whistling around their dens in Graubünden. With these whistles, which are in fact cries, marmots warn each other. A single whistle signals a golden eagle attack from above, whereas a series of whistles signal danger from below. In many places, «Munggen», as marmots are called in Graubünden, have lost their shyness to humans. Grisons (German: Graubünden, Italian: Grigioni; Romansh: Grischuns) is the largest and easternmost canton of Switzerland. The canton shares borders with the cantons of Ticino [a majority Italian-speaking canton], Uri [one of the three founding cantons of the Swiss Confederation], Glarus [famous on this blog as the Zwicky-Kanton] and St. Gallen [who most-spoken language are Swiss German dialects] and international borders with Italy, Austria and Liechtenstein. The name Graubünden translates as the “Grey Leagues” [German grau, French gris, Italian grigio, Romansh grisch, all ‘gray’], referring to the canton’s origin in three local alliances, the League of God’s House, the Grey League, and the League of the Ten Jurisdictions. Grisons is also home to three [of four] of Switzerland’s ethnic groups and the subsequent languages of Swiss German, Italian and Romansh are all native to the canton. It is the only officially trilingual canton and the only canton where the Romansh language has official status. 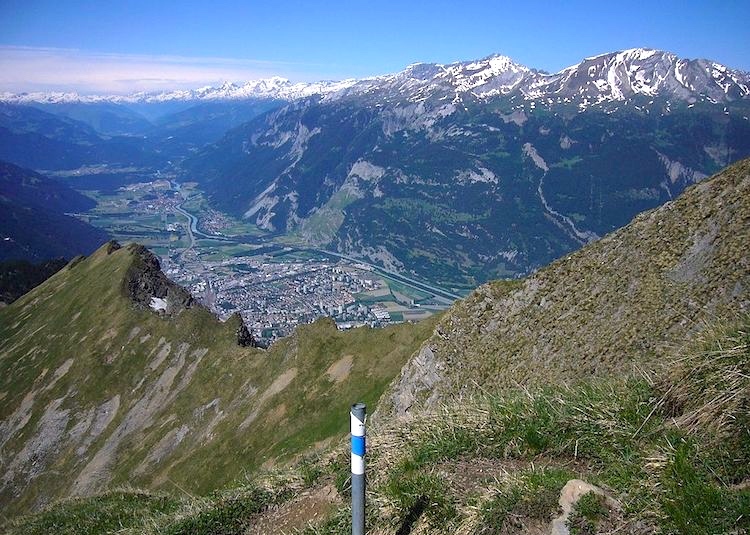 Chur or Coire is the capital and largest town of the Swiss canton of Grisons and lies in the Grisonian Rhine Valley, where the Rhine turns towards the north, in the northern part of the canton. The city, which is located on the right bank of the Rhine, is reputedly the oldest town of Switzerland. … Chur has a population (as of 31 December 2016) of 34,880 [roughly half the population of Palo Alto]. “A Nightingale Sang in Berkeley Square” is a romantic British popular song written in 1939 with lyrics by Eric Maschwitz and music by Manning Sherwin. Berkeley Square (pronounced ‘Bar-klee’) is a large leafy square in Mayfair, an expensive part of London. The Ritz Hotel referred to is also in Mayfair. The nightingale, a rare native songbird, is celebrated in literature and music for the beauty of its song. It favours rural habitats, and is unlikely to be heard in Central London. You can listen to Vera Lynn’s 1940 recording here. This entry was posted on September 15, 2017 at 7:28 am and is filed under Language and animals, Music, Names. You can follow any responses to this entry through the RSS 2.0 feed. You can leave a response, or trackback from your own site. I didn’t know Murmel for English marble. The German word I’m familiar with (from 19th-century poetry) is Marmor. It was bound to happen someplace. Marmots are fine up in Alpine meadows, but down in the town of Zermatt (for instance), they’re serious pests. Like groundhogs, prairie dogs, ordinary ground squirrels, and pocket gophers, marmots do not mix well with gardens and agriculture. Yet more on the little cuties. I think I have a jar of marmot oil cream somewhere, but I don’t really know what they taste like. As a kid I had some groundhog stew — the family’s way of coping with the pests on my aunt and uncle’s farm — and remember it as dark and gamey, but pretty tasty, at least after slow-cooking in wine. Their fat faces grace postcards, and their fat is used in salves. 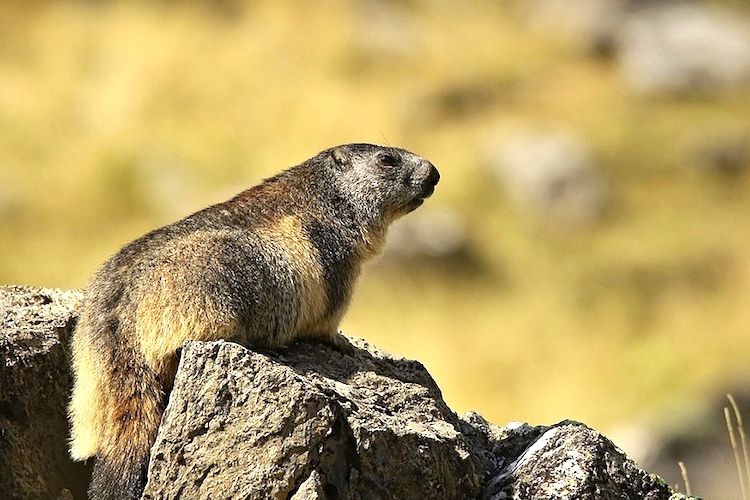 In Switzerland, the marmot is part mascot, part medicine chest – and for game lovers, a meal.